"...data analysis with DADiSP has been and continues to be a pleasure for our research group." Center for Engineering in Medicine at the Massachusetts General Hospital, Shriners Hospitals for Children, Harvard Medical School and Organogenesis, Inc. In the rapidly growing field of tissue engineering, researchers are striving to develop suitable artificial environments that allow human tissue to be grown outside the human body. In an effort to refine their bioreactor designs, researchers developing a bioartificial liver are using DADiSP to help them understand the oxygen uptake behavior of liver cells. Of primary interest in the field of tissue engineering is the effective reutilization of living cells in man-made housings to effectively reproduce organ function. Devices, known as bioreactors or bioartificial constructs, are highly dependent upon selection of effective fabrication geometries, such that all cells within the device receive adequate nutrients and oxygen. Oxygen consumption rate is an important design parameter in the fabrication of the BioArtificial Liver (BAL), now under development at the Massachusetts General Hospital and Shriners Hospitals for Children in Boston, MA. Unlike many other types of somatic cells, hepatocytes have the capability of operating at sustained hypermetabolic levels, under certain stimulatory conditions. While this is a highly desirable attribute from a BAL design perspective, as fewer total cells are needed, it also presents a formidable design challenge, as the bioreactor must be constructed in such a manner that the cells do not suffocate themselves from their unusually high oxygen consumption. To help solve this problem, it is therefore important to have precise data concerning hepatocyte oxygen consumption characteristics. The measurement of cellular oxygen uptake involves the use of a closed reaction chamber with an embedded Clark polarographic oxygen electrode. A typical experiment is conducted by measuring oxygen tension over time, after the chamber has been isolated from the ambient environment. 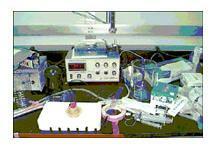 Since it is a closed system during the experiment, oxygen tension decreases with time, as cells respire. Key BAL modeling parameters, Km and Vmax, which are derived from experimental oxygen tension curve data, are the goal of this class of experimentation. Accurate generation of oxygen tension-time curves is not trivial, however, in that the Clark electrodes exhibit a significant noise spectrum, which is further compounded by the signal drift resulting from the mixing within the reactor chamber. As a result, interpretation of raw 16-bit oxygen tension data proved essentially intractable in initial experimentation, as the meaningful slope data was buried in a sea of spectral noise, even after signal enhancement by online numerical averaging techniques. To remove the spectral noise, it became evident that frequency-domain based filtering techniques would be necessary. Additionally as each experiment generated several megabytes of data, a relatively robust data management system was necessary.